This pilot project, which builds on the Objects of Escape initiated during Tangible Memories, explores the therapeutic potential of cutting-edge technologies, to bring nature and natural environments into healthcare settings to enhance well-being. Using sound and image archives from the BBC Natural History Unit, we are exploring multi-sensory and immersive experiences, such as Virtual Reality, tactile ‘Mutual Instruments’ and a rocking chair that transports the sitter to the natural world through evocative soundscapes. This collaborative project is working alongside healthcare practitioners, families, and teenage and young adult patients at the Bristol Oncology Centre, and older people living with dementia, and their families and carers at Brunelcare’s Deerhurst home. For the first time today, we are testing out the soundscape interactive rocking chair at Deerhurst, following our successful trials at Westbury Fields during the Tangible Memories project. We have six residents, relatives and staff who are all looking forward to sitting, rocking, listening and imagining, for a half hour relaxation session in the Garden Room. 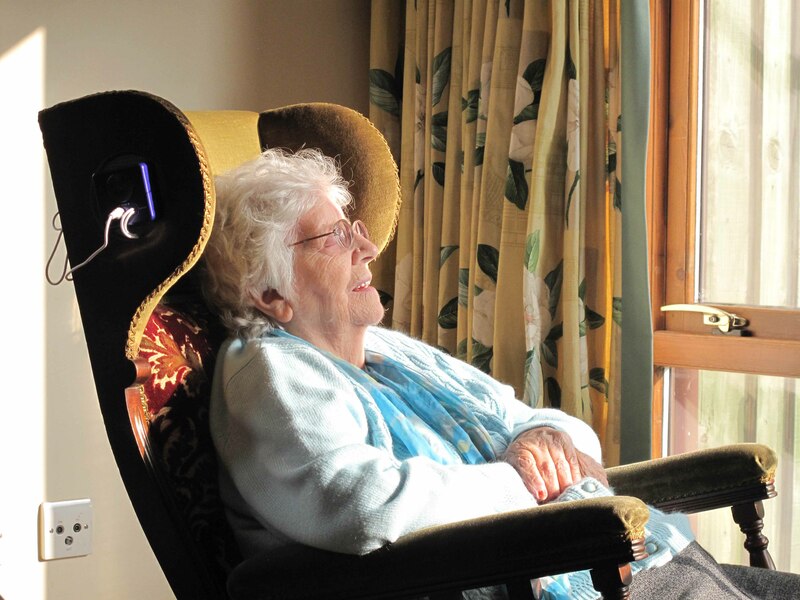 Designed for older people living with the advanced stages of dementia, the rocking chair plays sounds from the natural world, nature-themed poetry and music through speakers embedded in the headrest. The audio is triggered by the rocking motion of the chair, so the sitter doesn’t have to learn or remember an interaction. If the chair stops rocking, then the poems, music or nature sounds gradually fade away to quiet. The sound content plays at random, removing the onus of choice from the individual, and the associated anxiety and frustration of sometimes not being able to recall personal preferences. Our first participant today was assisted into the rocking chair from a wheelchair, with the help of care staff and a hoist. As she listened to sounds of the dawn chorus and waves on the seashore, she asked me what was causing the rocking movement of the chair. When I told her that it was her legs, pushing herself back and forth in the chair, she was surprised but very pleased – she told me that she can’t walk. While we have largely focused on the emotional and well-being effects of the rocking chair, it seems we have underestimated the potential physical benefits as well! There were two other highlight responses from today as well as this significant start. A lady called Thelma had felt very agitated and anxious before she joined us in the Garden Room to try out the rocking chair. By the time she left to go to lunch, she was smiling and happy, and seemed very uplifted by her experience. Thelma said she loved the music the most (more than the poetry or nature sounds), and she rocked in time with the rhythm of the music that she was listening to. She told me that she didn’t want the music to finish and at the end, repeatedly commented on how ‘that was so lovely’ and thanked me so much for the experience. She was moved to tears, telling me ‘oh, I could cry, that was just lovely’. Bidding goodbye, Thelma shook my hands in both of hers and kissed the back of my hand as she thanked me again. Another instance that seemed to illustrate the uplifting effects of the chair, was demonstrated by a lady called Joyce who joined us in the Garden Room in tears and was very sad and upset at the start. After sitting in the rocking chair, listening to birdsong, and to Vivaldi’s Four Seasons, Joyce began to relax and started chatting to me (about music, her father, and how she liked instruments). She recognized Wordworth’s Daffodils poem and quoted some lines from it as she was listening. She was able to sing along with several lines of ‘Let There Be Love’. She left the session seeming much happier than she was at the beginning. Here at Deerhurst, like at the Oncology Centre, I also shared a selection of natural objects with the residents, to see which items they were drawn to pick up and handle for the different tactile qualities. This feedback will contribute to artist Steve Symons’ decision-making with regards to which materials he will use to design and produce a handheld interactive prototype for residents to pick up and play. From this box of objects, Joyce chose the rubber, the bamboo spoon and the silver birch birdcall whistle. With the spoon and the birch-whistle in hand, Joyce enjoyed tapping these two pieces of wood together, in time to the music she was listening to while rocking in the chair. As well as the many positive and encouraging responses from today’s participants, it was equally useful to observe aspects of the chair and app design that will need to improve in future developments of this initial prototype. For example, Thelma found it difficult to hear many of the softer nature sounds such as the cat purring, the sound of waves on the seashore or the crickets singing. It might be that this range of sounds is too subtle for those who are hard of hearing and, in future, we could reduce the number of these types of tracks – although some people do find them relaxing and calming, as these particular sounds have a similar effect to white noise, and they seem to help people fall asleep. Volume is also an issue. Residents have very different levels of hearing and the volume needs to be adjusted for each individual, then sometimes adjusted again within each track as a piece of music will suddenly get louder or dwindle away to a volume where people think it has stopped, if they can no longer hear it. Overall, this first day of testing the rocking chair at Deerhurst was a very valuable experience. Each of the participants seemed to gain something positive from sitting in the chair, ranging from a restful sleep to a noticeable transition from agitation to calm, from sadness to happiness. We look forward to returning to Deerhurst again next month and hope that we will once more see residents enjoying a sense of well-being provided by the rocking chair. The theme of CHI 2016 focused on using ‘technology for good’, which resonated with my key reason for attending this year’s event. Over the past couple of years, I have been part of this collaborative research project called Tangible Memories, which has developed creative technologies to benefit older people in care. One of these technologies has included an interactive rocking chair for older people with advanced dementia, and who are not often able to go outdoors. The chair plays soothing nature sounds, such as the dawn chorus or crickets singing on a summer’s evening, through speakers embedded in its headrest. The sound content is triggered simply by the rocking motion of the chair; stop rocking and the sound softly dies away. Our aim was to design an intuitive interaction that did not require learning (or remembering) while providing an experience that was both calming, particularly for those with anxiety, and which could potentially enhance the well-being of the individual, by the soothing rocking motion and by rekindling the imagination through evocative soundscapes. My colleagues and I had co-written a work-in-progress paper about this prototype and its test sessions that had been accepted into CHI 2016, so offering us the chance to share our research in person, with a specialist network of about three thousand conference delegates from all over the world. The opportunity represented a new prospect for my artistic practice, as well as occasion to receive valuable feedback on our concept, so I was delighted to be awarded a travel bursary from a-n The Artist Information Company in order to attend CHI 2016 as a freelance collaborator on this project, and to be able to accompany my colleagues from the University of Bristol Computer Science department. Alongside two days of the conference where we presented our rocking chair research, there was a huge amount on offer throughout the conference programme. 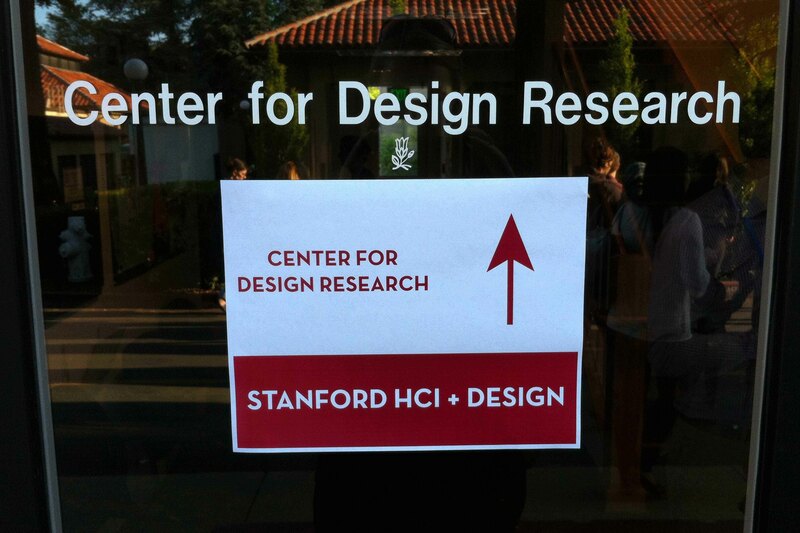 I enjoyed a group tour of Stanford University Design School in Palo Alto, and took part in a brilliant prototyping workshop hosted by a member of the School’s teaching staff there. This Open House event was also showcasing a number of Stanford’s collaborative projects through posters and demonstrations, which proved very intriguing and thought-provoking. Some teams were hypothesizing about the future, such as our increasingly close (even emotional) relationship with robots and drones, while others were in the process of developing new creative tools for education or entertainment. 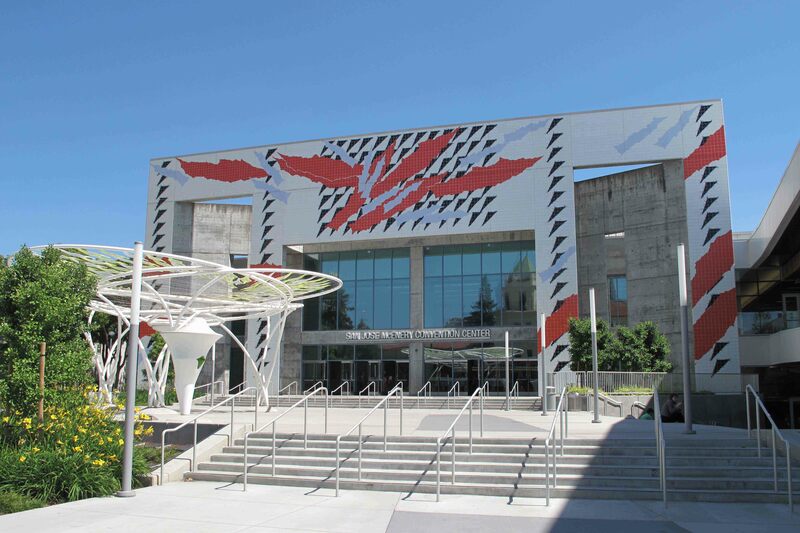 Back in the San Jose Convention Center, I attended a Special Interest Group discussion that was reflecting on a variety of different approaches to the theme, ‘Technology for disabled and older people’. There was some acknowledgment of the importance of social interaction and the need to address well-being for people in this defined group, although more generally, it seemed as if the computer science sector tends to focus on designing assistive technologies in support of people’s physical needs, without the same degree of attention given to their emotional or mental health. Amid all the ultra hi-tech on display throughout the conference, and profound questions being asked about the impact of ubiquitous artificial intelligence on human society, it was somehow reassuring to see how much the robots had to rely on human help for basic tasks like pressing the button to call the lift, navigating narrow doorways and identifying which seminar room was showing the presentation that they were interested in attending. 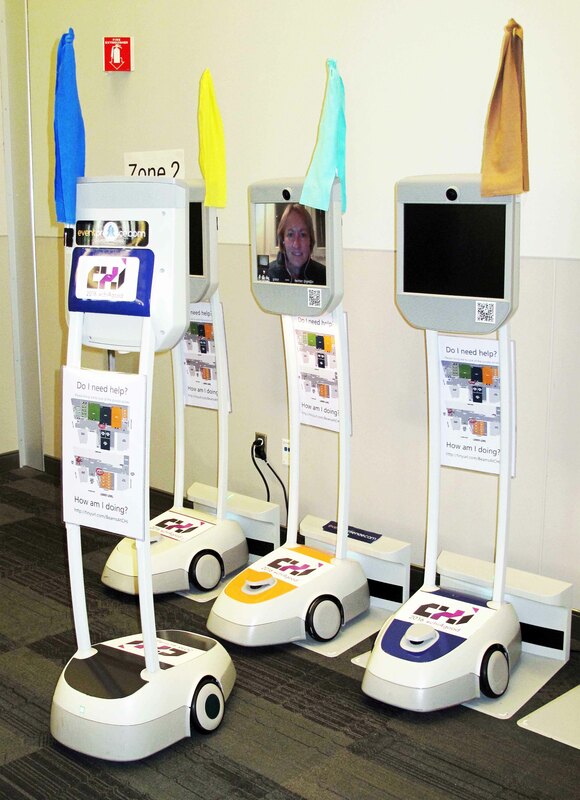 I found myself feeling rather affectionate towards them on account of their robotic clumsiness. On the whole, the dense conference programme of formal paper presentations was mostly dominated by highly technical and academic computer science research, far exceeding my non-expert understanding. However there were two stand-out presentations in particular, that were much less abstruse to the lay delegate (but no less rigorous) and completely absorbing. The first was a scenario, brilliantly presented by Joseph Lindley from LICA at Lancaster University, about pushing the limits of design fiction, where he made a compelling case for fictional research papers. 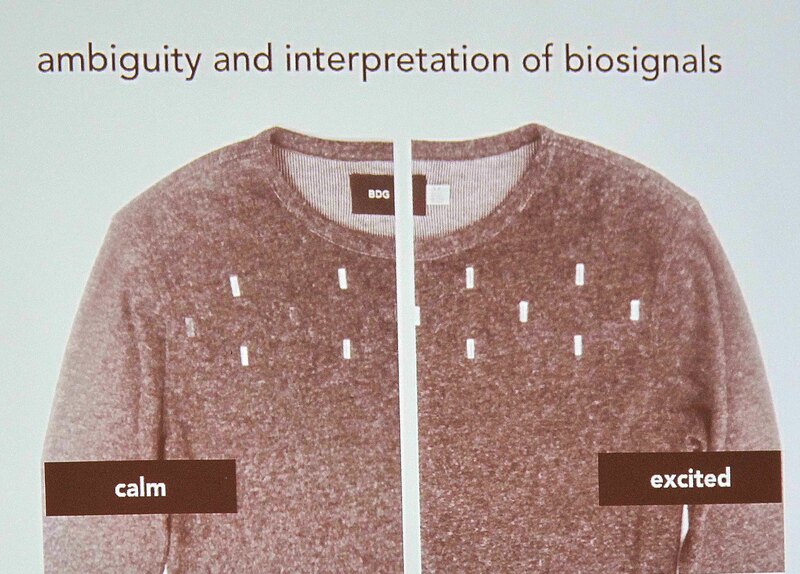 The second highlight paper for me was titled, ‘I don’t want to wear a screen’: Probing Perceptions of and Possibilities for Dynamic Displays on Clothing. This presentation shared the extensive research collaboration between UC Berkeley and Google Advanced Technology and Projects (ATAP). Together these two organisations have developed interactive digital textiles using conductive jacquard thread coated in thermochromic paints. 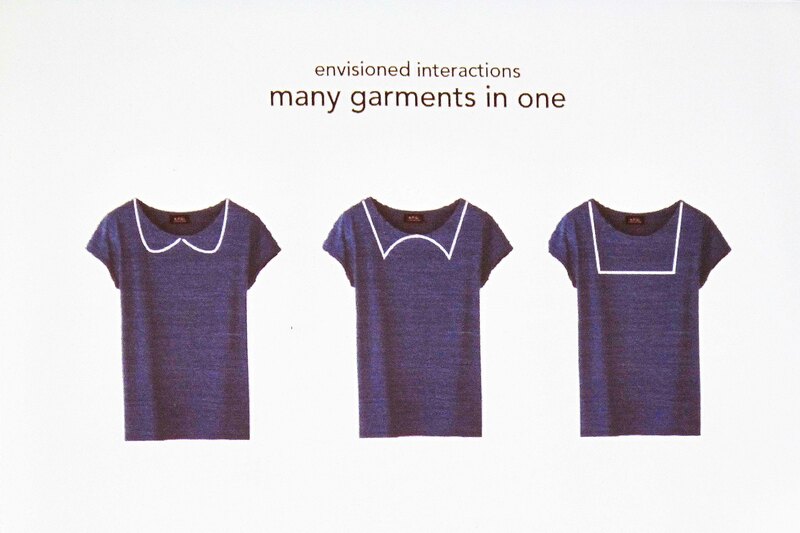 Once made into garments, these dynamic textiles enable the wearer to send subtle social biosignals, or simply enjoy a versatile design. 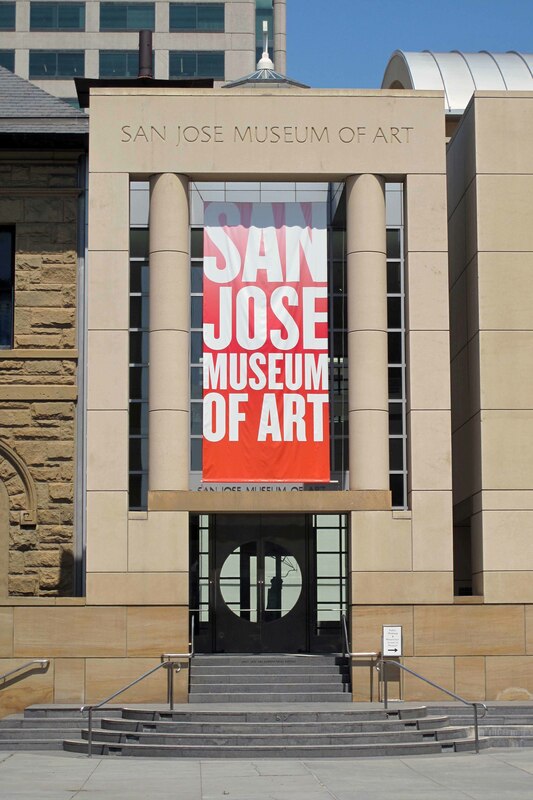 After five days of intense note-taking, discussion and mind-boggling thought about the seemingly infinite possibilities of technology, I found some artistic solace in the cool, reflective space of the San Jose Museum of Art, and in a chance meeting with another artist. Back in 2012, in Glasgow, I had met a San Francisco-based sculptor called Heidi Wastweet at an arts conference, and greatly admired her work. When I knew I would be visiting San Jose, I had contacted Heidi to see if she could work her schedule for a catch up while I was in the area. Thanks to the capabilities of Facebook technology (computer-human interaction at work) we met in person, via another conference, after four years, to talk patination and letter-carving techniques over lunch and then made a visit to the art and photography exhibitions in the Museum. 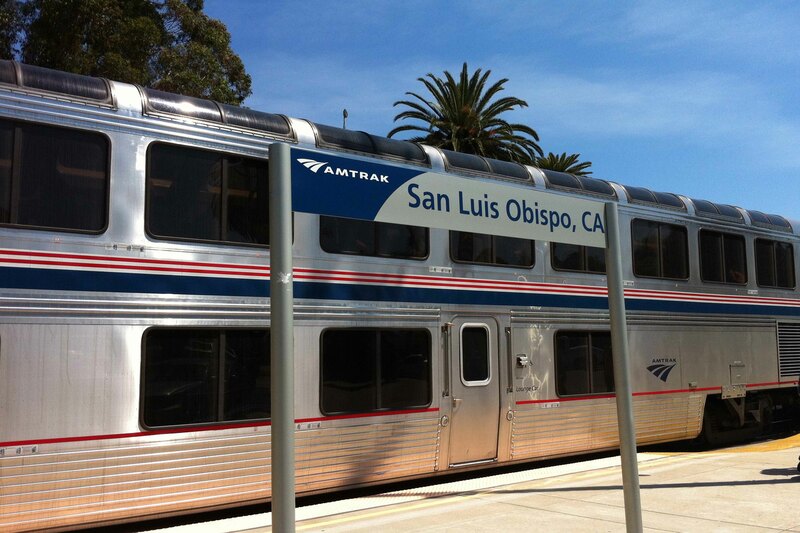 Following this delightfully serendipitous afternoon, I headed off to San Jose station where I boarded a double-decker Amtrak train bound for Van Nuys in Los Angeles. My return flight was out of LAX, so I had arranged to visit and stay with some friends who live in LA for a few days, before heading home. What a vast and varied landscape! The epic sweep of California can only begin to be appreciated by opting for slower forms of transport. The journey also provided a great opportunity to assimilate the conference experience and step out of my full immersion into the encoded world of computer science. 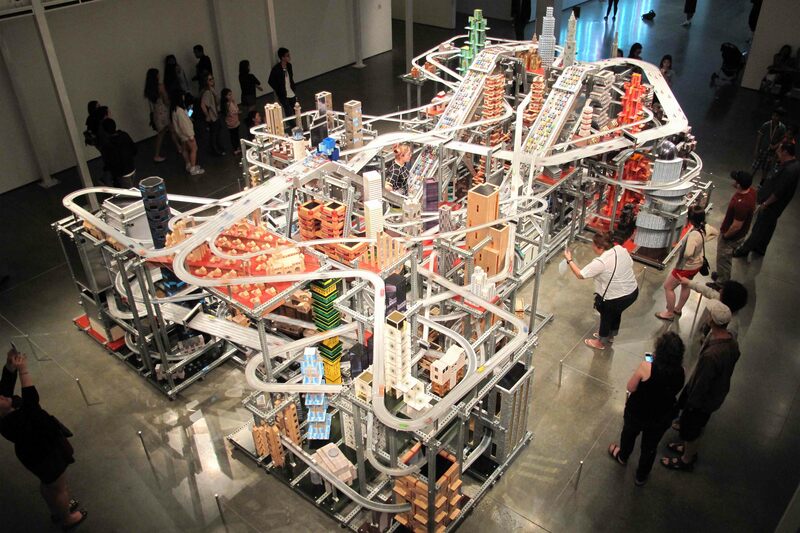 Embracing my comfort zone once more, I relished a visit to the Los Angeles County Museum of Art to see a great range of sculptural work including Chris Burden’s Metropolis and Robert Irwin’s Miracle Mile, both particularly well situated against the backdrop of LA culture. 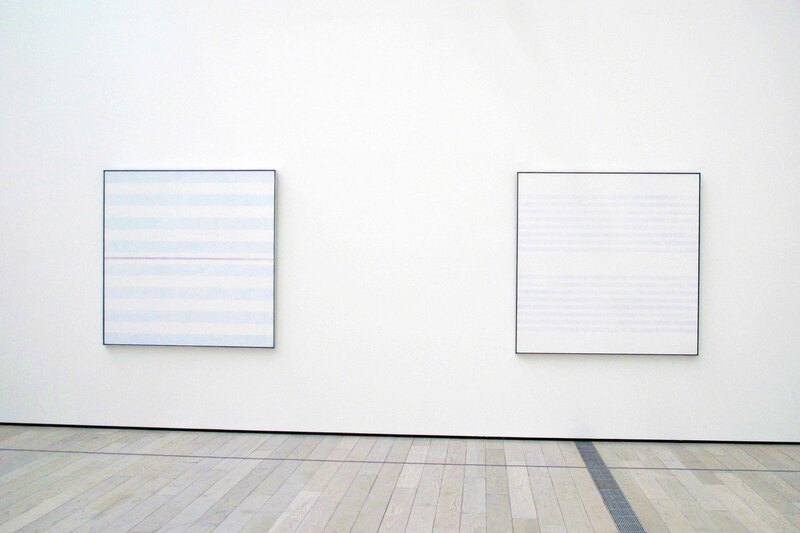 A quiet but somehow moving exhibition of Agnes Martin’s work marked a new artistic discovery for me, and I was drawn to her concentrated abstract lines and muted coloured canvases. Martin believed that it was spiritual inspiration and not intellect that created great work. ‘Without awareness of beauty, innocence and happiness’ Martin wrote, ‘one cannot make works of art’. I planned to keep this profoundly sensitive, uplifting and outward-looking artistic approach in mind, on my return to England, when I would be continuing to develop the nature sounds rocking chair for older people with dementia, with a focus on providing a sense of well-being through the beauty of nature. 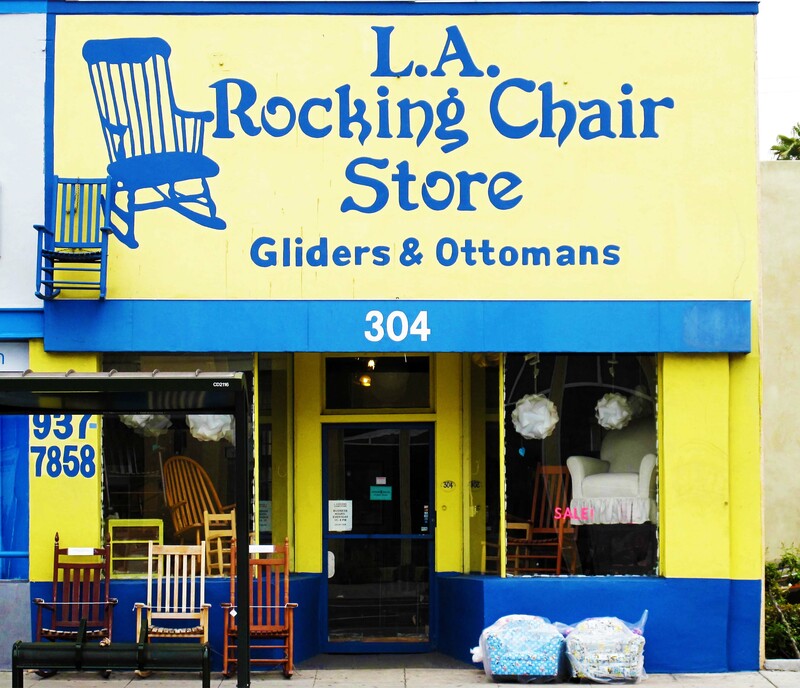 As coincidence would have it, just around the corner from where I was staying with friends, in District La Brea, I happened upon the only known rocking chair store in Southern California. The manager was a very friendly local lady who invited me to browse and try out the different types of rocking chairs, despite my inability to purchase anything and ship it back to the UK. 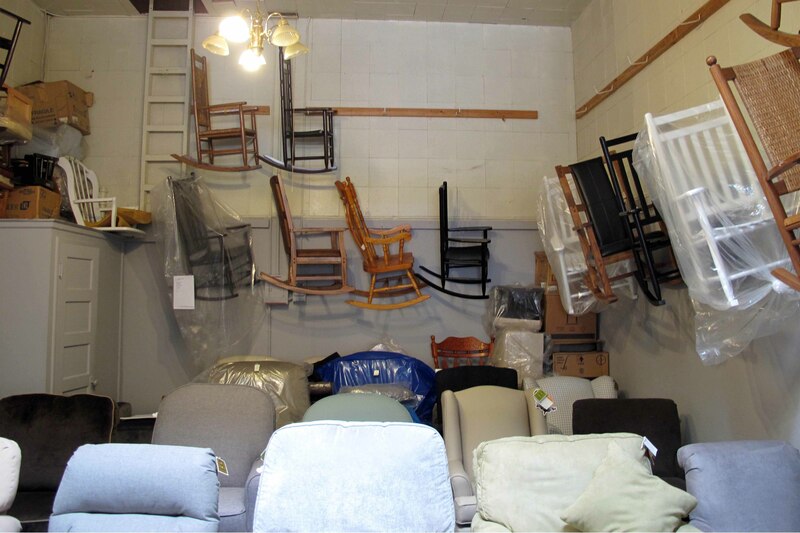 I told her about our project and she kindly allowed me to take some photos, including a shot of the back room, where some of the stock had to hang from the walls in order to fit in. A framed poster proudly suggested presidential endorsement of the humble rocking chair. 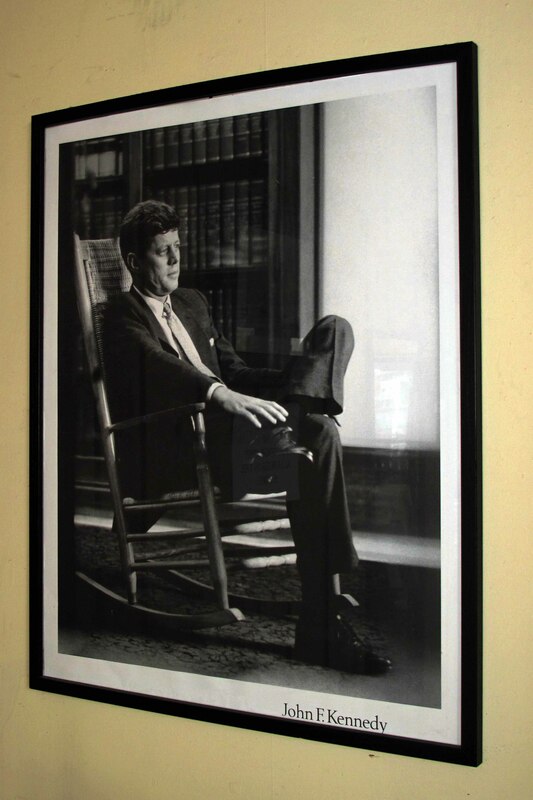 As I enjoyed the soothing comfort of one of the many rockers in the shop, I noticed how serene JFK looks in this image, and thought about how difficult it seemed somehow, to feel stressed in a rocking chair. These are pieces of furniture designed for unhurried relaxation, for contemplation perhaps, provided by the rhythmic calming motion that was gently tilting me back and forth. As my mind started to wander, I began to look forward to developing new ideas around well-being for our nature sounds rocking chair back in the UK, and felt creatively fortified by the experience of this entire trip, that has provided me with an huge amount of inspiration for many months to come. A few weeks ago, we met with the Deputy Care Manager of the specialist dementia home that we are working with, in order to discuss the possibility of testing out our therapeutic rocking chair in situ, with some of the residents. After some very useful conversations about health and safety, in perspective with positive risk-taking to ensure quality of life, we walked around the communal areas of the home, to choose a suitable location for the rocking chair to be situated on the initial test day. 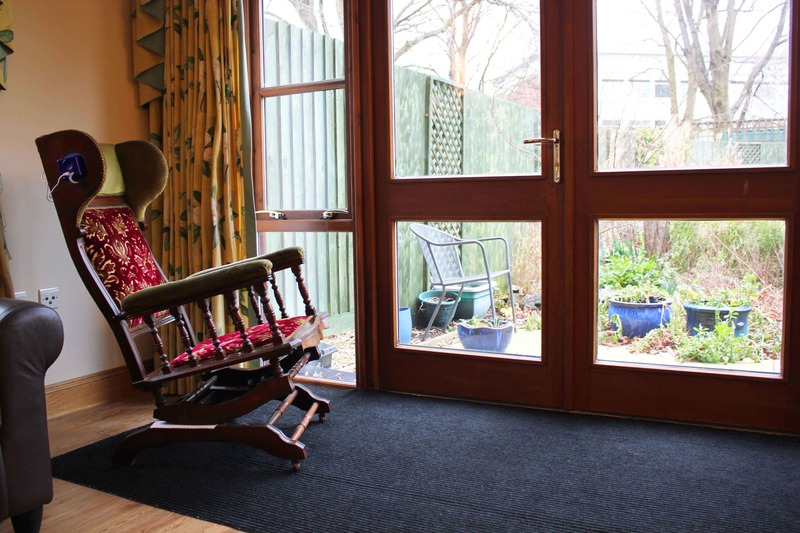 On the test day, the rocking chair was trialed by eight residents and four care staff. It was very touching to watch their reactions and witness some delightful responses, not only to the chair itself as a novel item of furniture in the home, but also to the varying sound content triggered by the rocking motion and movement. Later in the day, we decided to adjust the sensitivity of the app so that it would trigger the sound from much more subtle movements, in order to correspond to the level of strength and capability in some of the residents. 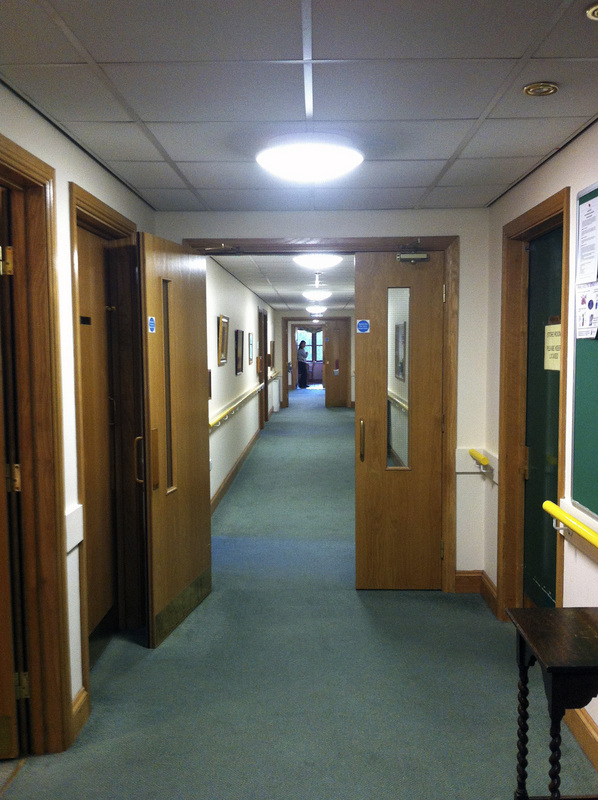 Where their own physical co-ordination had deteriorated, residents were passively rocked by a member of staff who moved the chair on their behalf. One resident was only able to activate the sound content via the app when holding my iPhone in her hand, and making small gestures to keep it moving and playing. As a result, alongside the interactive rocking chair, we are planning to develop a handheld object-based version of the app, by embedding an iPhone into a tactile object, such as a foam ball, that could be used for armchair exercises for older people in care homes. Continuous movement of the object would similarly trigger sounds, music or poems, combining light muscle activity with a spontaneous audio experience. On the test day, not all the residents seemed to recognise that sound was triggered by movement through the rocking motion, or necessarily to register that sound was playing at all, but this did not seem to matter. 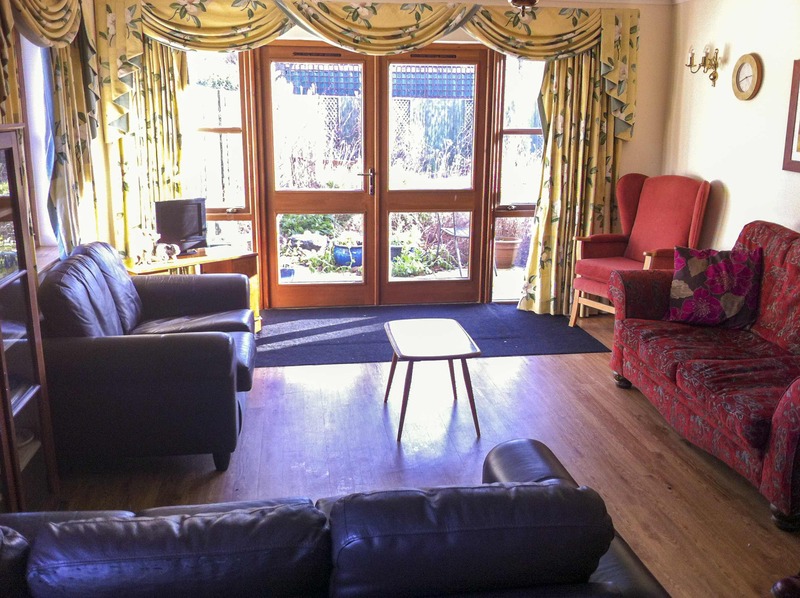 At some level, all the residents appeared to benefit from, and engage with the therapeutic rocking chair experience, even if it was simply to snooze in the sunshine, or relax and enjoy the new position overlooking the garden. We look forward to developing our prototype over the next few months!